Doral has always had a concern for the health and wellbeing of its residents and visitors. Because of this the city council adopted the Doral Bikeway Project in January of 2007. This plan is to improve the recreation options of the City through the construction of a connected network of trails. These trails will not only be for recreation, but can be used to get around the City. The Doral Bikeway Project is slated to be completed in a 10 year timeframe. As of September 2010, 2.5 miles of the 13 planned miles had been completed. It is projected that the project will meet its 10 year goal and will be complete in 2017. The City commissioned Kimley-Horn and Associates, Inc. for the project at an estimated cost of $2.6 million. The Department of Public Works Director encourages for their safety that everyone uses the trails between sunrise and sunset. It is hoped the new bike trails will provide a safe and enjoyable way for residents and visitors to enjoy the outdoors and promote fitness in the City. At the start of the project no bike lanes were available on the City streets. 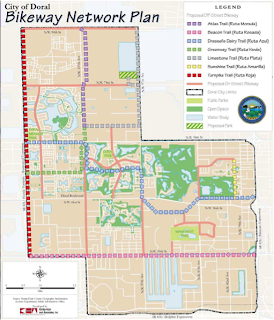 With the addition of the Doral Bikeway Project the City Council hopes to provide residents and visitors a safe alternative. As of the latest census, there were almost 30,000 residents and 100,000 people employed in Doral. The City hopes the new bike trails will be a way of getting more people outdoors and offering residents, employees working in the City, and visitors more incentive to stay and enjoy life in Doral. The League of American Bicyclists’ national Bicycle Friendly Communities (BFC) model was used in planning the new bikeway. It includes the “Four E’s”; Education, Encouragement, Engineering, and Enforcement. The Bikeway Plan includes outreach programs aimed at developing a complete community bicycling program by having a Safe Routes to School program and using the Bikeway to promote the Get Fit Doral program. The trails will be open to pedestrians, bikers, and people using rollerblades. These shared use trails will be away from motor traffic and will give users access to parks, work, shopping centers, and give them a chance to easily visit neighbors. Part of the new bikeway trails will be on-road. These will include bike lanes, unmarked bike lanes, wide curb lanes, and padded shoulders. These paths can be used to travel parts of the City not included in the shared use trails. Benches, trailheads, trash receptacles, shelters, and interpretive signs will be included in the trail infrastructure to enhance the recreational opportunities. Once it is completed the Doral Bikeway Project will be yet another reason why residents and visitors enjoy life in Doral. The City of Doral is committed to maintaining and developing a high standard of living in Doral. The new bikeway trails are just another example of this commitment.